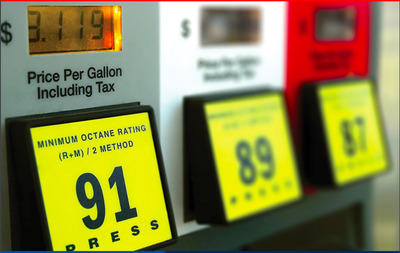 AAA91 octane isn’t absolutely necessary. AAA found that modest improvements in horsepower and fuel economy weren’t worth the extra cost of premium fuel. AAA and the Automobile Club of Southern California’s Automotive Research Center subjected six different vehicles to extensive testing. It’s ultimately up to owners to decide if premium fuel is worth it, but choosing regular won’t harm engines. Last year, AAA undertook an extensive study of whether motorists can gain anything from using premium gasoline. The verdict was that Americans are wasting over $US2 billion annually on 91 octane and above. Following on what was a comprehensive, 41-page report, AAA joined with the Automobile Club of Southern California’s Automotive Research Center to investigate whether car owners can gain anything from putting premium fuel in vehicles that recommend but don’t require it. You probably know where this is headed. The research revealed that while recommended premium might upgrade fuel economy and performance, the additional cost isn’t worth it. “There’s no question that higher-octane premium fuel has the potential to boost a vehicle’s fuel economy and performance, however, engines have to be calibrated to require that fuel to see the full benefit,” John Nielsen, AAA’s Managing Director of Automotive Engineering and Repair, said in a statement. AAA pointed out that premium fuel can cost $US0.50 more than regular nationwide. The price difference has been on the rise since 2009. The 68-page report that AAA generated this time around was just as exhaustive as the previous effort. “For testing, AAA used 87-octane (regular) and 93-octane (premium) gasoline in six vehicle models varying in body style, size, type of fuel delivery system and air induction system,” the organisation explained in its report summary. Test vehicles included everything from a Mazda Miata two-seats sports car with a 2.0-litre four-cylinder engine to a Cadillac Escalade with a big 5,o-litre V8 motor. On balance, premium gas yielded modest improvements in fuel economy and performance – but not enough to warrant the additional expense, according to AAA. The bottom line is that if your vehicle’s manufacturer recommends but doesn’t require premium fuel, and your engine isn’t knocking when running in regular, you’re fine to spend less on the cheaper fuel. The story could obviously be different in vehicles that require premium, but in many cases these are high-performance cars where owners are happy to pay up for a boost in horsepower.